If you’re in the beginning stages of a full-scale remodel or scanning for minor ideas, here are our recommendations for inspirational storage tips and tricks to organize your space. 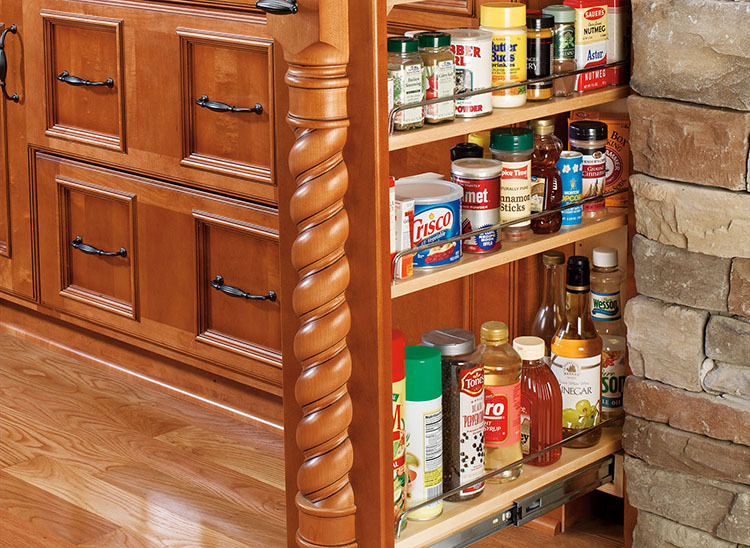 TACKLE THE PANTRY: first and foremost, simplify your life in the kitchen by organizing your pantry based on the following tips. When the clock is ticking, you don’t want to be rummaging around your pantry looking for that one item you “think you saw a few days ago”. Our tip for avoiding this common kitchen disaster is to place anything older than a couple months into distinct bins. That way you’ll make room for more frequently used items, and will know where to find those you use less. Another tip is to get rid of old plastic containers that are overused and don’t have lids attached. We suggest buying new containers in three different sizes for better stack-ability. DESIGN FROM THE INSIDE OUT: To make your kitchen look cleaner and work more efficient, pay as much attention to the inside of storage cabinets and drawers as you do to the pretty finishes or custom color options. If you are not completely gutting the kitchen, a manageable improvement is upgrading the interior of your storage with accessories. 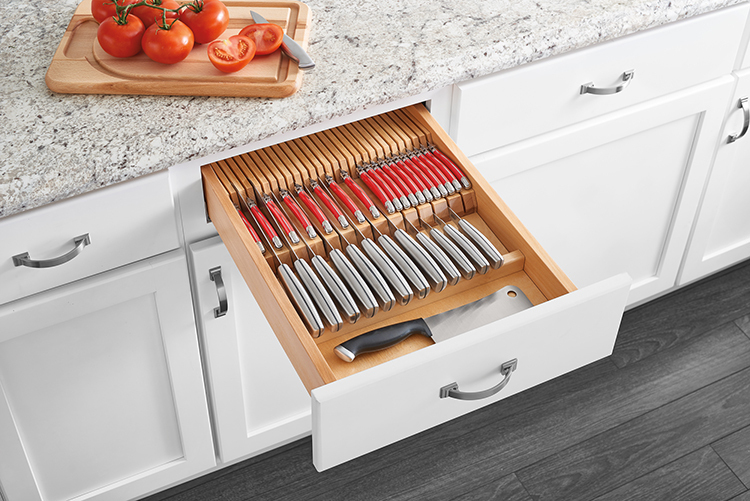 2-tier cutlery combo drawers, cutlery dividers, utensil and tray divider pull-outs are just some of the many accessories that will keep your cabinets organized and efficient. SET UP STATIONS: For effective organization, divide your kitchen into distinct areas so that you can store stuff where you use it. Remember that each section should have its own purpose. For example, a specific space for cleaning, preparation, cooking, food and non-food storage. The idea behind this tip is to store everything in your kitchen in its corresponding station. 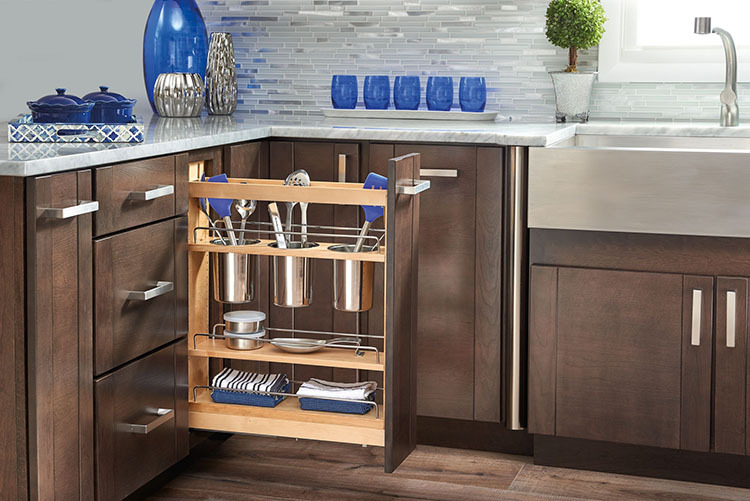 Since your dishwasher and sink is your cleaning zone, your everyday dishes should be stored in close proximity. Same works for storing pots and pans near the stove. Additionally, Tupperware and lesser-used appliances should be tucked away in the non-food storage station. Follow this tip and you will definitely identify the things you are not using on a daily basis, which you may not need at all, or, at the very least, may need to store somewhere else. Make sure to think logically so that each item is placed according to their point of main use. How do you organize your kitchen cabinets? We’d love to hear about your techniques in the comment section below.